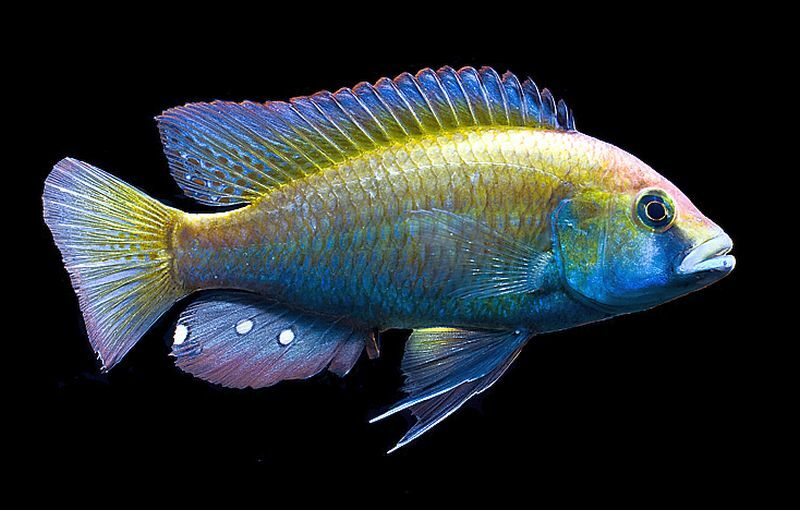 Tag Archive | "Eastern Happy"
Eastern Happy (Astatotilapia calliptera) are found in Lakes Malawi, Chiuta and Chilwa; the Lower Zambezi, Buzi, Pungwe and Save River systems, and near Thumbi East Island in Lake Malawi. 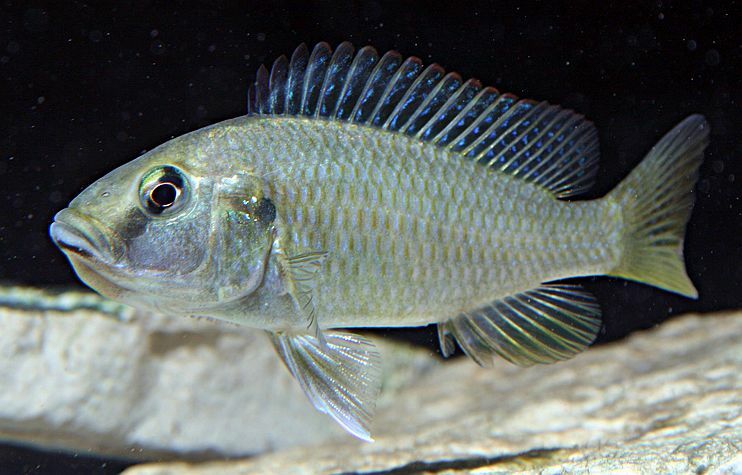 They are also recognized as Haplochromis callipterus by some tropical fish keeping enthusiasts and are commonly called the Eastern Bream, Eastern Happy or Calliptera. The Eastern Happy cichlid has blue lips and a black to dark brown line that runs through the eye, which is a common trait of Lake Victorian cichlids (i.e.angled black markings through the eye and on the operculum) and which is why Astatotilapia calliptera is often misidentified as Astatoreochromis alluaudi. The males are usually a greenish to yellow hue with red and blue highlights. The females are smaller in size and remain a fairly subdued greenish gray color. Juveniles of the species are difficult to differentiate between. 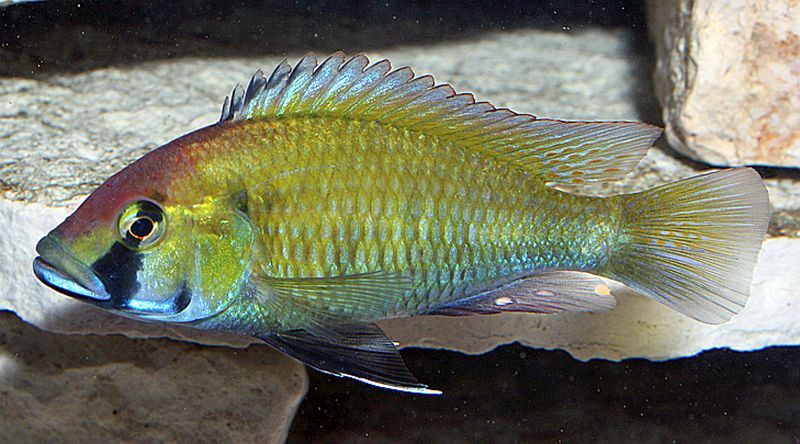 Unlike some Lake Malawi cichlids, Astatotilapia calliptera are found in the more vegetated areas of the lake in shallower water, and also in the rivers and streams around the lake. The Eastern Happy cichlid is considered to be a relatively peaceful cichlid for Lake Malawi however, males are highly aggressive towards the same species when sufficient space is not provided. Sufficient space for two male Astatotilapia calliptera is about a 125 to 150 gallon tank, which is much larger than what is required for the average Malawi cichlid. As long as their tank mates do not share their appearance or species, and as long as they are similar in disposition and size, they should be fine housed together. Astatotilapia calliptera should be housed in an aquarium of at least 75 gallons that is furnished with a sandy substrate and a lot of rock caves to mimic their natural environment. These cichlids prefer a lot of open space and should be provided enough room for them to swim around freely in the tank. Live plants can be added to the tank decor with the understanding that they may occasionally become part of the Eastern Happy‘s diet. Eastern Happy cichlids are mouthbrooders that are relatively easy to breed in the aquarium. The female will lay several batches of eggs on a substratum which the male then fertilizes. Almost immediately after fertilization, the female will collect the eggs into her mouth where she incubates them for 12 to 14 days at 79 degrees F. After the eggs hatch out, the female releases the young and both of the parents will guard the fry for 5 to 7 days. When danger poses a threat, the female scoops up the fry into her mouth until the threat passes. In their natural environment, Eastern Happy cichlids are mouthbrooders that feed on algae, plankton, plants, invertebrates, and small fish. In an aquarium environment, they should be fed a variety of live, frozen, and freeze dried bloodworms , brine shrimp , earthworms, mysis shrimp, ghost shrimp , or small feeder fish as well as high quality vitamin enriched flake foods and pellets. Always feed them what they can consume in a few minutes, once or twice a day instead of feeding them a single large portion. Eastern Happy cichlids are available as juveniles and as adults in size from 1 1/2″ to 5″.